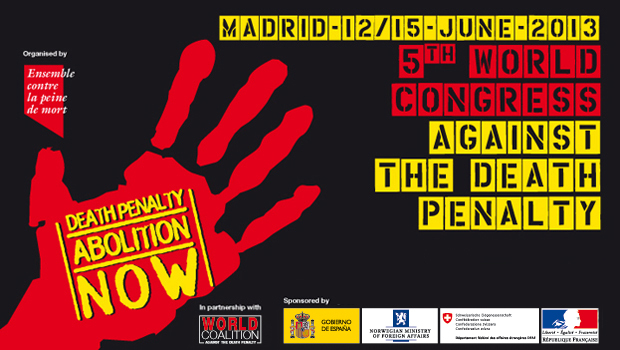 The 5th World Congress against the Death Penalty, organised by Ensemble Contre la Peine de Mort (ECPM – Together against the Death Penalty) in partnership with the World Coalition against the Death Penalty, takes place in Madrid, from June 12th to 15th, 2013. The International Commission against Death Penalty, supporter of the event, is represented by its President, Mr Mayor, and Commissioners, Mr Badinter and Ms Greve. Since 2001, those involved in the international movement for the repeal of capital punishment have convened every three years for a World Congress against the Death Penalty. The 5th World Congress, which is held in Madrid at the invitation of the Spanish Government and with the support of the Governments of France, Norway and Switzerland, follows those of Strasbourg (2001), Montreal (2004), Paris (2007) and Geneva (2010). More than 1,500 people from over 90 countries are expected to attend the Madrid Congress. Among them there are prominent political and cultural persons with a high profile in the abolitionist movement. During these three days, divided between plenary sessions, round tables and workshops, non-governmental organisations (NGOs), politicians, lawyers and academics are invited to review death penalty developments and discuss abolitionist strategies at the national, regional and international levels with a specific focus on the regions of Africa and the Middle East. These strategies will encourage complimentary action by States, intergovernmental organisations and NGOs. More than 60 years after the adoption of the Universal Declaration of Human Rights the trend towards abolition is clear. Today, some 150 countries have abolished the death penalty in law or practice. Despite this positive international trend, however, there is no room for complacency as long as some States continue to use the death penalty. The 5th World Congress is an opportunity to celebrate achievements, review current challenges and define future strategies to achieve a death penalty free world.